“I had a dream, which was not all a dream. Fig.1. 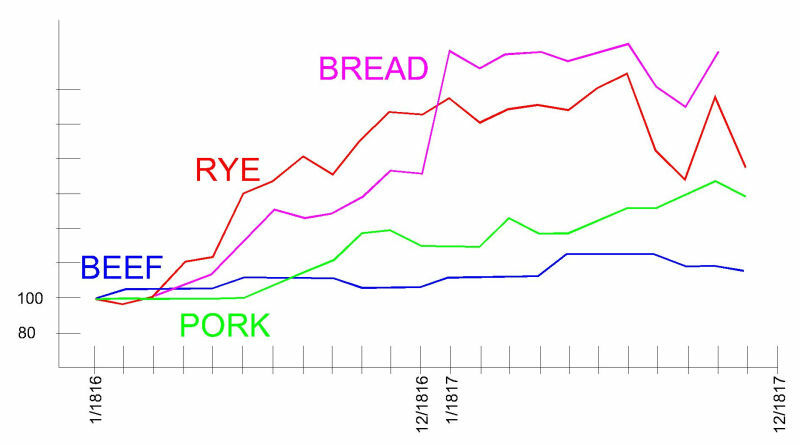 Development of costs in the years 1816-17 of important articles of food in Europe. Especially crops and bread, essential for the large and poor populations on the continent, experienced a massive increase in costs due the failed harvests. Meat was still a precious resource available only to a limited group of persons at the time; the reduced livestock therefore could still satisfy the demand (modified after ABEL 1974). The strange behaviour of the weather was unexplainable at the time. Nobody could imagine that the origins of the strange phenomena were to be found on the opposite side of earth, where an entire mountain had annihilated itself in the largest volcanic eruption of modern history. The estimated 4.000m high volcano of Tambora on the island of Sumbawa in Indonesia erupted with an intensity of VEI 7 – 100x stronger than Mount St. Helens. 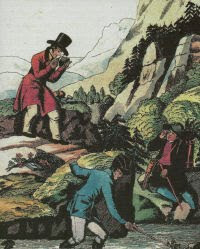 During the peak of eruption April 10, 1815 the mountain lost 1.300m height and catapulted estimated two million tons of debris, particles and sulphur components into the higher layers of the atmosphere. These aerosols reduced the solar radiation on earth’s surface and influenced worldwide weather patterns for years to come. Thousands of people died by the direct effects of the four month lasting eruption, like poisonous clouds and gas, large pyroclastic flows and tsunamis. In the surrounding area of the volcano the vegetation was killed and the soil poisoned for years. Many more suffered from the climatic effects and the aftermath of the eruption. Almost the entire northern hemisphere, in a period with already cool climate, experienced an ulterior drop of temperatures, famine and diseases spread over the world. Fig.2. 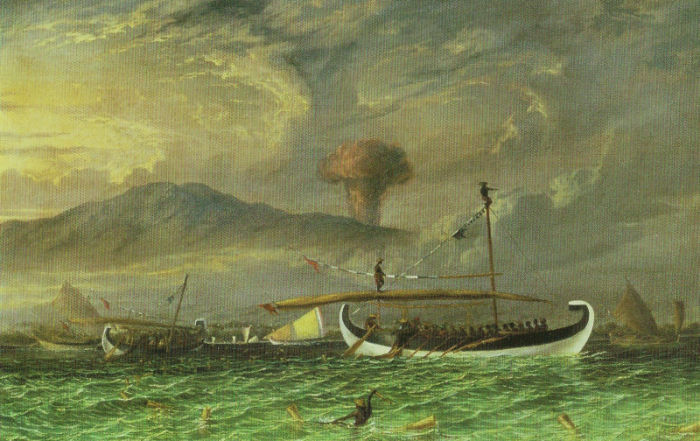 "Volcano and fishing proas near Passoeroean, on the Java coast, Indonesia" by Thomas Baines (1820-1875). “Island of Sumbawa, 1815. – In April, 1815, one of the most frightful eruptions recorded in history occurred in the province of Tomboro, in the island of Sumbawa, about 200 miles from the eastern extremity of Java. In the April of the year preceding the volcano had been observed in a state of considerable activity, ashes having fallen upon the decks of vessels which sailed past the coast. The eruption of 1815 began on the 5th of April, but was most violent on the 11th and 12th, and did not entirely cease till July. The sound of the explosions was heard in Sumatra, at the distance of 970 geographical miles in a direct line; and at Ternate, in an opposite direction, at the distance of 720 miles. Out of a population of 12,000, in the province of Tomboro, only twenty-six individuals survived. Violent whirlwinds carried up men, horses, cattle, and whatever else came within their influence, into the air; tore up the largest trees by the roots, and covered the whole sea with floating timber. Great tracts of land were covered by lava, several streams of which, issuing from the crater of the Tomboro mountain, reached the sea. So heavy was the fall of ashes, that they broke into the Resident’s house at Bima, forty miles east of the volcano, and rendered it, as well as many other dwellings in the town, uninhabitable. On the side of Java the ashes were carried to the distance of 300 miles, and 217 towards Celebes, in sufficient quantity to darken the air. The floating cinders to the westward of Sumatra formed, on the 12th of April, a mass two feet thick, and several miles in extent, through which ships with difficulty forced their way. The darkness occasioned in the daytime by the ashes in Java was so profound, that nothing equal to it was ever witnessed in the darkest night. Although this volcanic dust when it fell was an impalpable powder, it was of considerable weight when compressed, a pint of it weighing twelve ounces and three quarters. “Some of the finest particles,” says Mr. Crawfurd, “were transported to the islands of Amboyna and Banda, which last is about 800 miles east from the site of the volcano, although the south-east monsoon was then at its height.” They must have been projected, therefore, into the upper regions of the atmosphere, where a counter current prevailed. Along the sea-coast of Sumbawa, and the adjacent isles, the sea rose suddenly to the height of from two to twelve feet, a great wave rushing up the estuaries, and then suddenly subsiding. Although the wind at Bima was still during the whole time, the sea rolled in upon the shore, and filled the lower parts of the houses with water a foot deep. Every prow and boat was forced from the anchorage, and driven on shore. The town called Tomboro, on the west side of Sumbawa, was overflowed by the sea, which encroached upon the shore so that the water remained permanently eighteen feet deep in places where there was land before. Here we may observe, that the amount of subsidence of land was apparent, in spite of the ashes, which would naturally have caused the limits of the coast to be extended. The area over which tremulous noises and other volcanic effects extended, was 1000 English miles in circumference, including the whole of the Molucca Islands, Java, a considerable portion of Celebes, Sumatra, and Borneo. In the island of Amboyna, in the same month and year, the ground opened, threw out water, and then closed again.